A whiff of sparrow at the window, late night nuzzles, camping in the redwoods: here are the first twelve months in the lives of Scotty and Athena, told in unforgettable prose. Have you ever gone bejabbers at the bugs, fallen into scritchy bliss, played paw-ball at dawn? Ever cavorted with slippery lightbeams and delectable fuzzies, made unexpected discoveries in your own house, thrilled to the coo of a Scottish Fold? 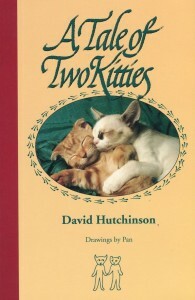 Cat lovers adore this book!